Thanks to Maille for sponsoring today's post. All thoughts and opinions are my own. When spring is in the air, there’s almost nothing I’d rather do than pack a picnic, grab a book and head outdoors. It doesn’t have to be fancy or elaborate. After all, the chance to eat outside after all the winter months indoors is exciting enough. Simple sandwiches, some fruit, maybe some cookies, that will do. Now I should point out that when I say simple sandwiches, I don’t mean simple in flavor. Rather, I mean sandwiches made from a few superior ingredients. The key to a good sandwich, after all, isn’t quantity of ingredients, but rather quality. Bread from our local bakery versus store-bought bread, roast chicken versus deli meat, a nice cheese versus the pre-sliced kind…. you get the idea. And most importantly, in our household at least, no sandwich is complete without a touch of Maille Dijon. It may not seem like much, but just a little goes a long way in elevating a sandwich from mediocre to delicious. 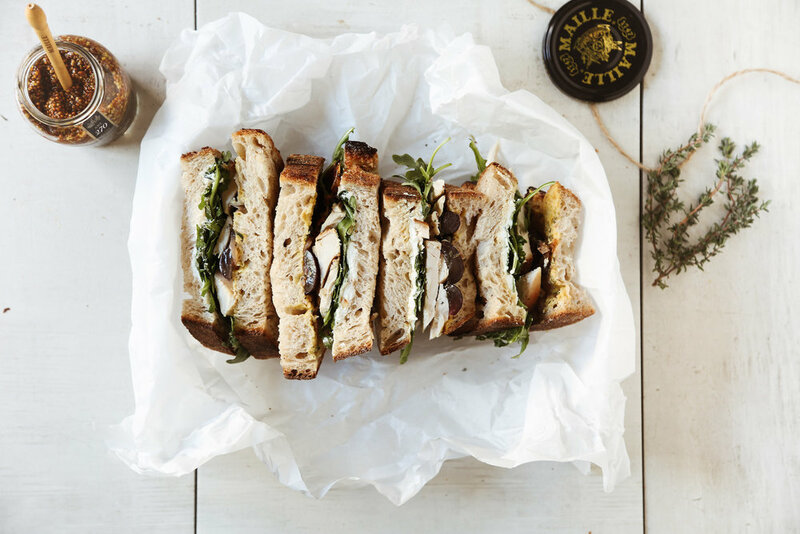 One recent picnic sandwich I created with Maille is a Provençal Chicken Sandwich, essentially a roast chicken sandwich layered with a few of my favorite Provençal flavors, like goat cheese, grapes and fresh arugula. I’ve tried making it with several different Maille mustards, all very good, but the Honey Dijon is my favorite for this sandwich recipe. The sweetness in the mustard works perfectly with the sweetness in the grapes which then ties together with the creamy cheese, buttery shallots and fragrant thyme for a sandwich that just tastes like spring. 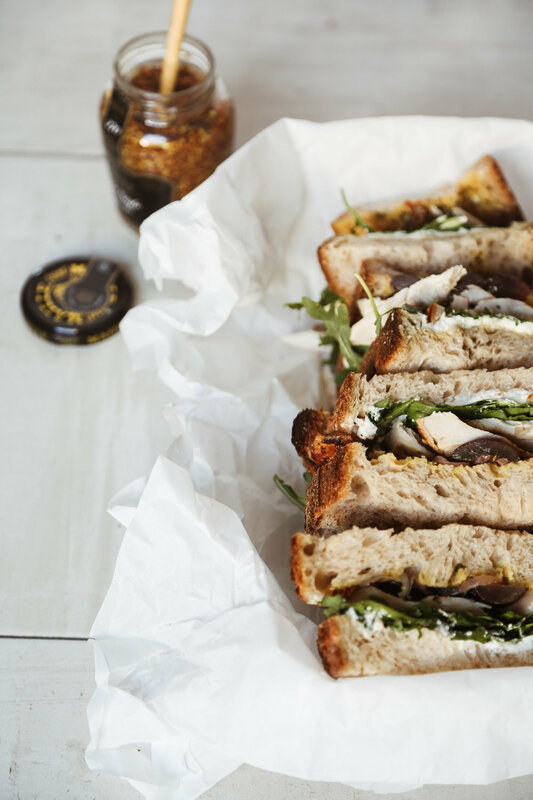 Peek the video below to see just how easy it is to assemble this Provençal Chicken Sandwich recipe and get it packed up for a picnic in no time. What do you like to pack for a picnic? If you said sandwiches, be sure to spill the deets on all your favorite sandwich toppings in the comments below! I’d love to know! Spread goat cheese on one slice of bread. Top with arugula, chicken, grapes, shallots and herbs. Spread Maille on the second slice of bread. Place on top and slice sandwich in half before eating, or wrapping it up to take it on the go. I like to serve my sandwich with extra mustard and Maille cornichons on the side.